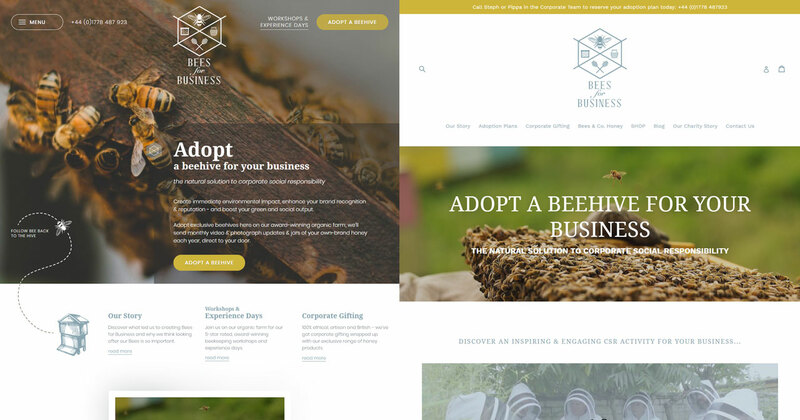 Over the last few months we’ve been working on a fifth brand for Jez by redeveloping his Bees for Business website; a company offering beehive adoption, workshops and experience days with the hope of assisting in reversing the declining global bee population. 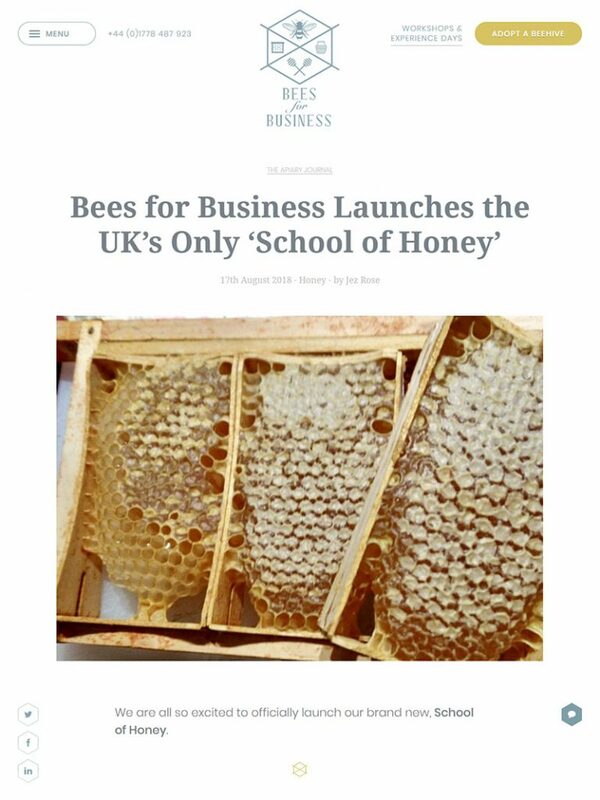 The first iteration of the Bees for Business website was created using Shopify to allow Jez to get the business up and running quickly and adapt as the business found its feet in those first few months. After that first year trading, and with a clearer idea of how the business was growing and evolving it was time to let Bronco loose and deliver a website that would take the business to the next level. Our role was to provide a new design based on the existing branding to deliver a more engaging experience, improve conversion and clarify the vision of Bees for Business. Looking at the existing website it was clear that the design was limited by the theme used and the Content Management System. While the e-commerce section would remain in Shopify for budgetary reasons our intention was to remove the bulk of the static pages from the CMS in order to deliver a more customised and engaging design as well as benefit from the speed improvements that can be gained through shedding the weight of a CMS. One of the issues we really wanted to solve was better utilising the header and banner spaces, especially on the homepage where the amount of whitespace was contributing to a bland looking website and the lack of call to actions gave no clear route to conversion. Through small changes, the new design provides a far more graphically rich experience that offers multiple call to actions with little compromise in functionality. Though we’ve lost the basket, login and search these are features that weren’t really relevant to the new website with the shop now a separate entity. The navigation, though hidden behind a button, takes that prime top left location to retain prominence while a couple of important pages are highlighted on the other side of a centralised logo. This vastly reduces the whitespace that existed in the old design. In instances where we design websites with a large banner image that has a defined horizontal break we’re always conscious that a small number of users may not scroll due to thinking there is nothing below this area. Research shows these types of users are in decline however with space available we’ve added a small element of whimsy in our bee trail that leads the user to scroll down below the banner to more information. While most of the internal pages adopt a slimmed down version of the homepage banner, on the blog we dropped this image. We were concerned that displaying two large images so closely would detract from the blog post and its featured image. Though we could use the banner space for the featured image it would have resulted in a tight crop with much of the image obscured by the header elements. The result is a Medium-esque look to the blog which is still sympathetic to the design of the rest of the website whilst aiming to promote ease of reading given the expectation of more long form content appearing here than in any other area of the website. Not all websites are filled with advanced functionality or complex bleed-edge design techniques. In some respects Bees for Business is a simple website. But simple also doesn’t mean a lack of effort on ours or the client’s part. As with all our websites, we carefully consider how best to maximise its potential with the information provided, blended with our own research and experience that ultimately delivers on the goals of the client. Bronco are a joy to work with and time and time again out-trump themselves. Experienced, highly knowledgable and patient, there was no one else we would have trusted with such an important and key website to support our rapid growth and brand development.